From 213 lbs. (left) Marian Tia Romero slimmed down to 121 lbs. 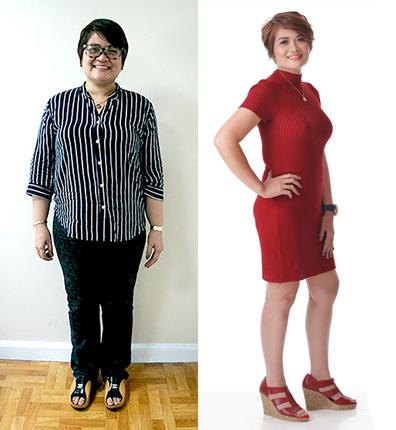 This was the reason why businesswoman Marian Tia Romero reached her heaviest weight at 213 lbs. But resolute in her goal to lose weight and cure her polycystic ovarian syndrome, she changed her lifestyle and committed to it. “I had to give up salt, sugar, carbohydrates, oil, and dairy,” she shared, which she admitted was difficult at first. Her commitment to the lifestyle change as prescribed by the Cohen Lifestyle Program was rewarded as she slimmed down to 121 lbs. and her PCOS symptoms were eliminated. At 200 lbs., human resource manager Ian Montenegro had a lot of weight-related issues. She suffered from sleep apnea, knee pain, insomnia, sinus congestion, and shortness of breath. Her blood chemistry test results were also not good. She had difficulty finding clothes that fit, her mobility was limited, and her self-esteem was at its lowest. She then tried calorie-counted food delivery, protein shakes, vitamin supplements, and tea concentrate to lose weight in the past. She even hired a personal trainer to customize an exercise program. But none of them worked for her. This had been an issue for internal medicine doctor Mary Anne Tangcangco, too. 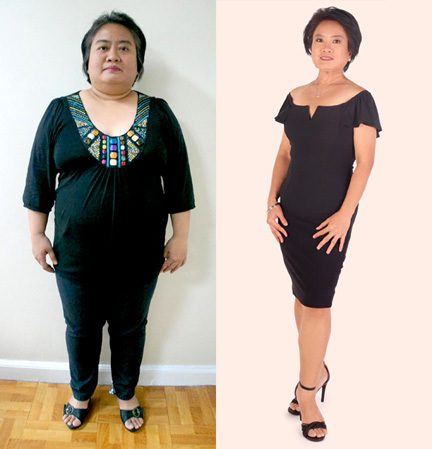 Dr. Mary Anne Tangcangco from 189 lbs. (left) is now down to 128 lbs. Dr. Tangcangco said she also tried almost everything (except drugs) to lose weight. She tried fad diets, Pilates, and aerokaebo (a combination of aerobics, karate, and boxing). She lost weight when she was younger but she gained the weight back as she used food for emotional comfort particularly after she lost her mom. “I used to eat when I was happy and celebrating. I ate when I was sad and stressed,” she said. 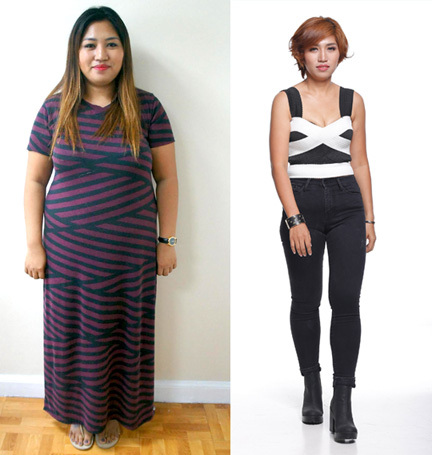 She reached her heaviest weight at 189 lbs. and she had to take medicines for high blood pressure. Later on, nothing seemed to work for her anymore, not even with calorie counting, Bangkok pills, diet teas, and coffee. Like Romero, Montenegro and Dr. Tangcangco changed their lifestyles as well. Inspired by another doctor who lost weight on the Cohen program, Dr. Tangcangco decided to give it a try. “I turned to the Cohen program because I wanted to do it right and I needed the right people to help me,” shared the 42-year-old doctor. When no other weight loss methods seemed to work anymore, Cohen’s Lifestyle Program proved to be the most effective. Not only did she lose the extra weight, she is glad to report that she is no longer hypertensive and does not need maintenance medications anymore. Meanwhile, Montenegro said she found enrolling in the Cohen program practical. “Instead of buying an expensive machine for sleep apnea, it made more sense to go into a sustainable diet program that would not only address my (weight) problem but the other medical conditions I had,” she averred. Cohen’s Lifestyle Program is a personalized eating program based on each client’s unique blood test results (not blood type). Without requiring exercise, injection, artificial food, and drinks, or intake of weight loss pills and supplements, the program delivers fast results, with clients usually losing up to eight to 10 pounds a month. The program provides individualized food “prescriptions” such as the precise amount of food combinations. Cohen’s Lifestyle Centre also teaches lifestyle changes that have been found to balance the hormones that cause weight gain (Insulin, Serotonin, and Human Growth Hormone). The food combination triggers the body’s natural ability to release fat as source of energy. In the process, the body does not only shed weight but vital organs are also rid of harmful toxins that disrupt their natural physiological function and cause disease. Ian Montenegro from 200 lbs. (left) to 111 lbs. For the past nine years, Cohen’s Lifestyle Centre Philippines has helped thousands, including celebrities and professionals, lose weight rapidly and healthily, as well as alleviate serious health conditions. Go to www.cohenlifestyle.com.ph for more information.